Share your gratitude on your wedding day! Make a donation in honor of a family member, friend or cause that is held close at heart instead of buying each guest a gift that may never be used, couples have started to replace favors with a donation to a charity or cause that is meaningful and important to them. The wedding tradition of giving your guests a favor at their place setting actually began back in the 13th century. This tradition originated in the Roman Empire when a newly wed couple would give five sugarcoated almonds to each of their guests at their wedding celebration. Over time, this tradition spread and by the 18th century, France, Italy, Greece and eventually the United States began participating in this timeless tradition. Why sugarcoated almonds and why five of them? 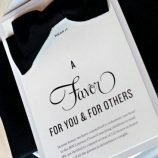 Over time, a couples desire to stand out and be unique also impacted the tradition of giving guest favors with a meaning of well wishes. Most recently, a trend in wedding favors is to make a donation in honor of a family member, friend or cause that is held close at heart to the newly wed couple. 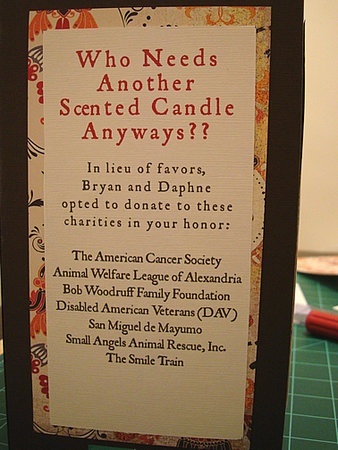 Instead of buying each guest a gift that may never be used, couples have started to replace favors with a donation to a charity or cause that is meaningful and important to them. In my opinion, this is an amazingly awesome trend! Donations chose by a bride and groom not only helps others in need but also lets guest’s know what charities or causes are significant to a couple and why. It is a great display of the gratitude a couple has for their lives, for each other and to be able to share this day with those they love. There are many ways couples can display gratitude with this trend while still showing their uniqueness as a couple. For example, couples that are animal lovers can make donations to local animal shelters helping to keep animals alive and safe. Other couples may want to better the world’s environment; a donation can be placed to an eco-friendly organization that impacts the world around us. The most popular scenario is a donation placed towards research to find a cure for an illness or a disease that has personally affected the loved ones of the bride and groom. Although the “to have and to hold and to keep your beer cold” cozies and favors of the like are cute, in many cases guest favors never even leave the reception hall and if they do they eventually end up being tossed out in the trash. When a donation is given in lieu of guest favors it provides a modern twist to the belief in “life’s bittersweet journey” and when starting a marriage with a gift of contribution, the newly wed couple sets a foundation for a life overflowing with goodness. 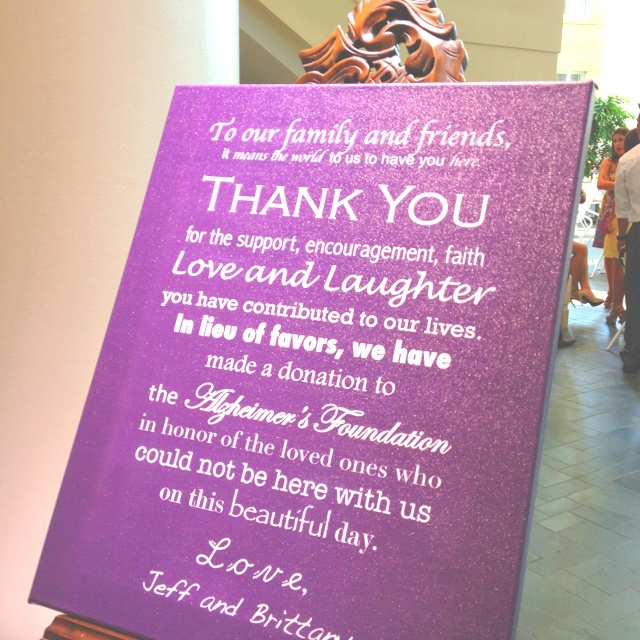 Have you considered giving a donation in lieu of favors for your wedding celebration? If so, what kind of charities would you donate to and why?